The Hairy Growler Green Field collection. 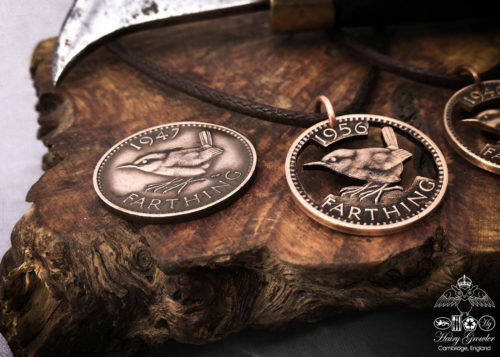 The 'moon gazing together' shilling pendant is meticulously handcrafted in Cambridge, UK. 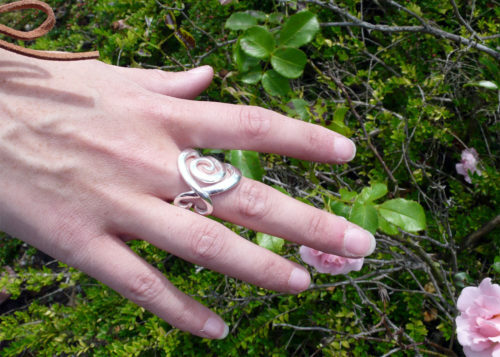 “The design is freehand drawn onto the silver shilling. Several holes are drilled and the sections are delicately cut away. 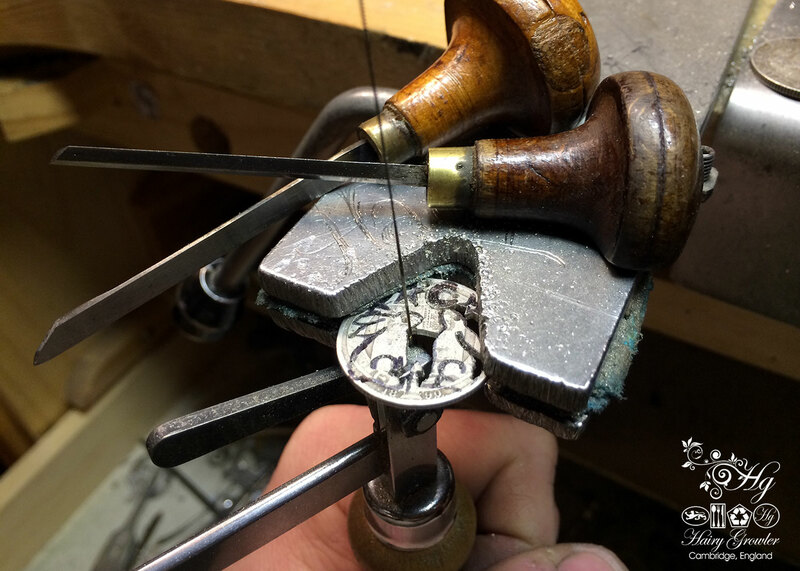 The edges are filed and the details are carefully hand carved, smoothed and finally polished. 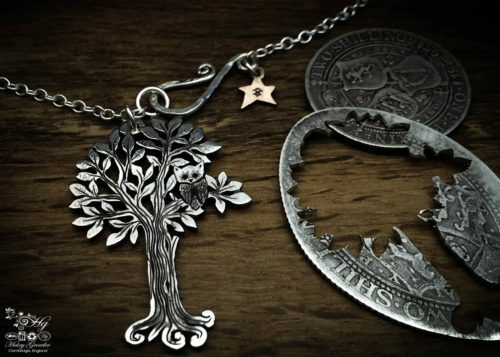 The end result is a lovely, original, recycled pendant with a fantastic history.” – The Growler. 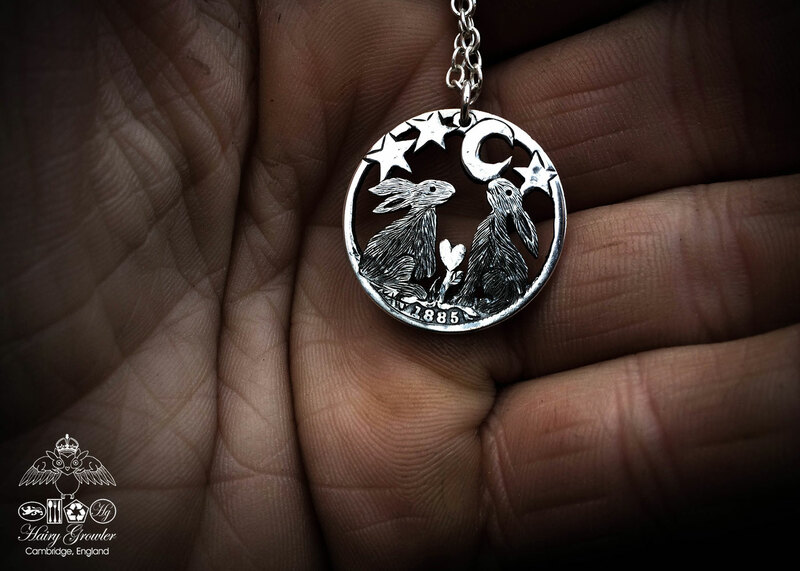 I have decided to hand cut each one of these lovely moon gazing hare pendants from only the finest antique sterling silver lucky shillings. 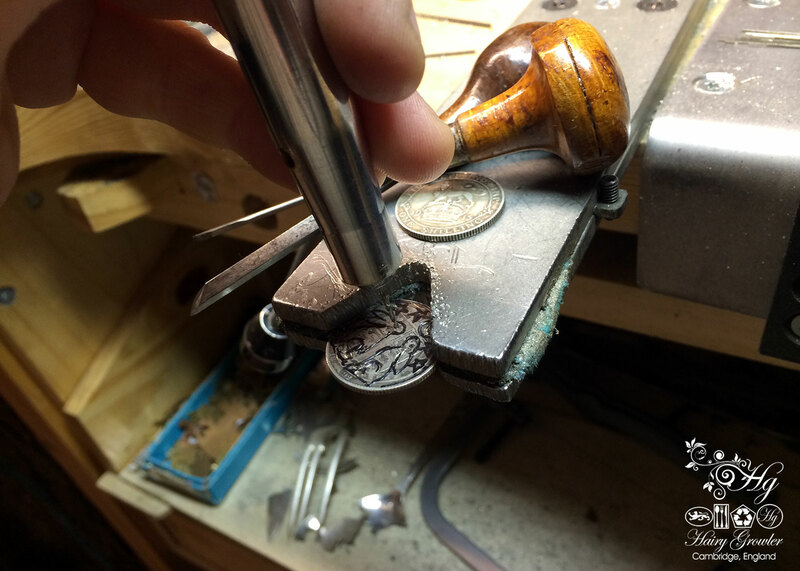 The design is freehand drawn onto the silver shilling. Several holes are drilled and the sections are delicately cut away. 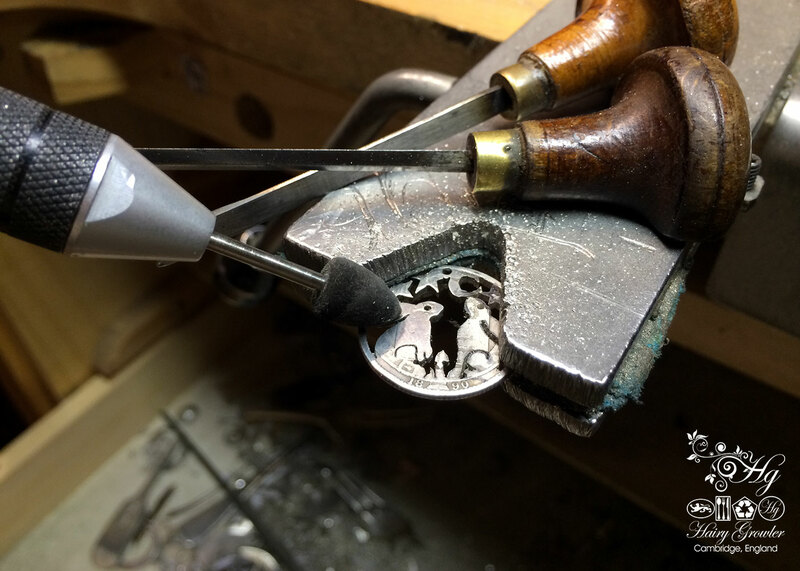 The edges are filed and the details are carefully hand carved, smoothed and finally polished. 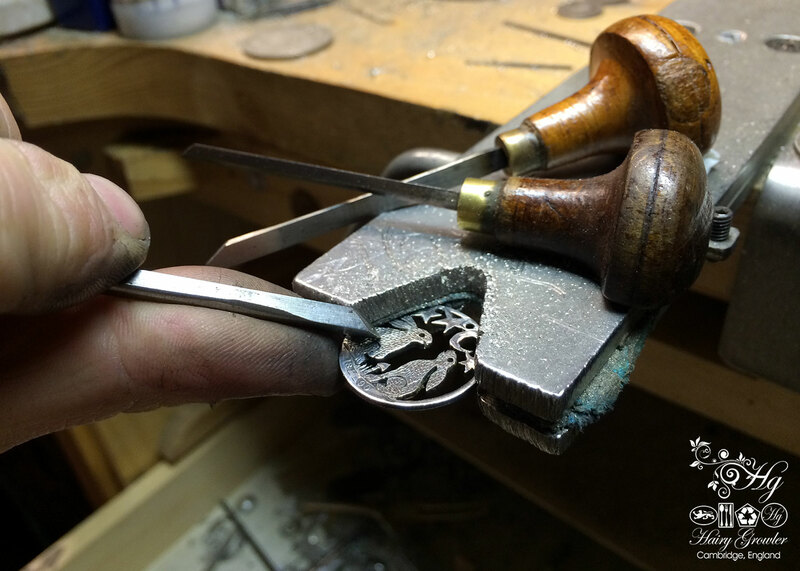 The end result is a lovely, original, recycled pendant with a fantastic history. Not only are you are welcome to request some personal, meaningful initials for the reverse, you are also welcome to select what you would like growing in the field. Choose a wild mushroom, wonderful ‘love grows’ flower or simply wild grass. 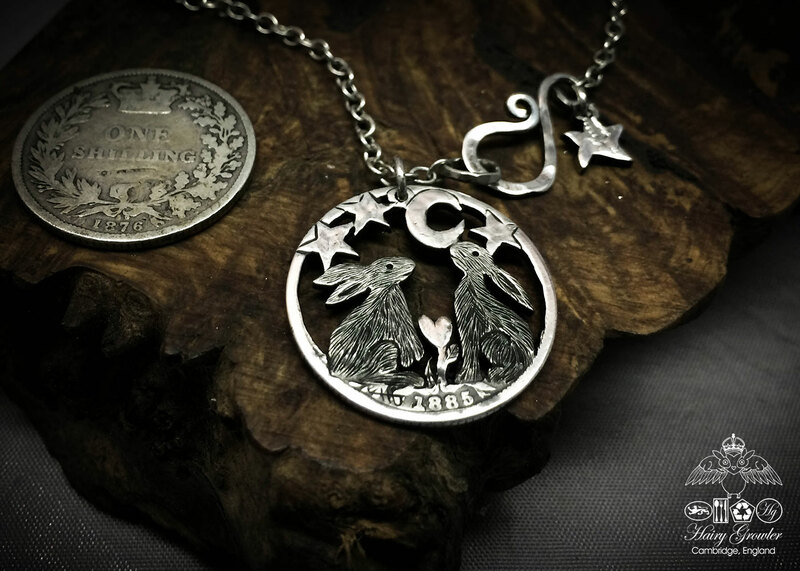 The moon gazing hares shilling is presented on either a fab sterling silver necklace with a handmade shepards crook safety catch and accompanying wee star, moon or heart… or a simple but lovely adjustable braided cotton necklace cord. She told our Son, that it symbolised Mum and Dad and that we were gazing up at the moon (which is our son, Ziggy Moon…) he said he didn’t want to be the moon, he wanted to be a little rabbit inbetween us. Enchanting and Beautiful. I adore this piece by The Hairy Growler, I’ve been a fan for years after stumbling across the Facebook page. 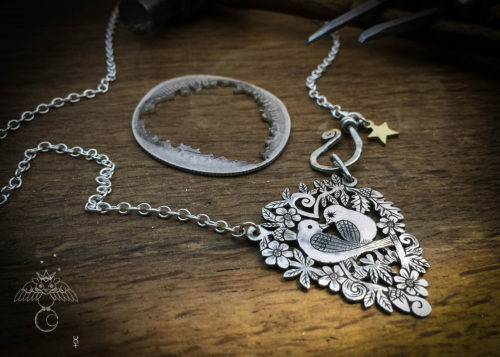 I was googling ‘one off, ethereal, hare jewellery’ after remembering my fave book as a child ‘masquerade’ after hours of searching I found EXACTLY what I was looking for and I could of cried as trying to describe my style of Jewellery was a nightmare! Now I just show my friends this website and they get what I like! This piece is my fave really because it’s everything I love rolled into one! 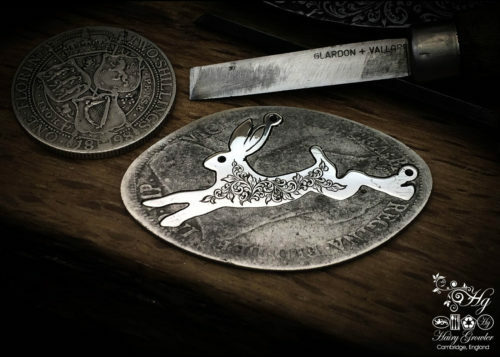 Hares, the moon and I was born in 1981 and this was 100 yrs old on my birth year, it’s delicate yet bold in it’s own right. Last Christmas he gave me his heart with this necklace. I have never had anything made for me before and I cried when I opened it. The following Easter he left my life and now I cannot wear this beautiful thing – it will always be cherished and handed down within my family from now on. 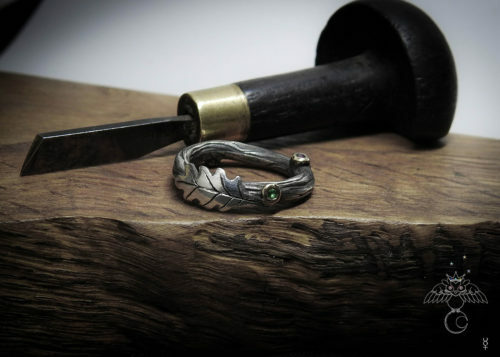 I now need to invest in another piece from this most talented craftsman. Such a gorgeous piece of artwork, I love it so much! My husband gave this to me for our anniversary and I love how it is personalised. Recieved this necklace from my husband on our wedding day two years ago. It is beautiful, we had a spring/rabbit themed wedding so it was such a perfect present ! I got some Hairy Growler vouchers for Christmas and had spent months trying to decide what do to get. 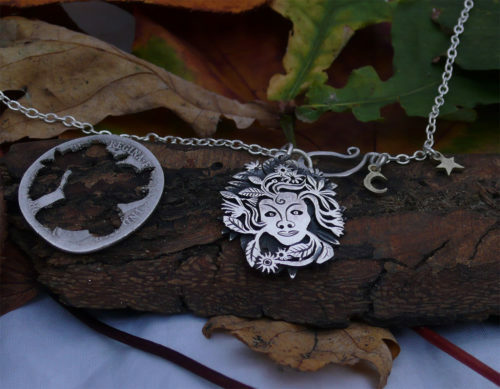 I really wanted a necklace made from a coin, something I could wear regularly and maybe pass on one day. When I saw ‘Moon Gazing Together’ it reminded me of Watership Down which I watched a lot when I was child. I loved the design and having my initials engraved was a great extra touch. The necklace is really well made and knowing it is a one off piece makes it extra special. I got this necklace to go with earrings I got for my wife last year. Beautiful work, which brought a tear to my wife and a couple of others in the room.